This post is going up late today and figured I would do a throw back to one of my older but most favorite layouts. I made this layout in 2014 and it was probably related to some challenge on A Cherry on Top, I am always up for one scrapbook challenge or another. 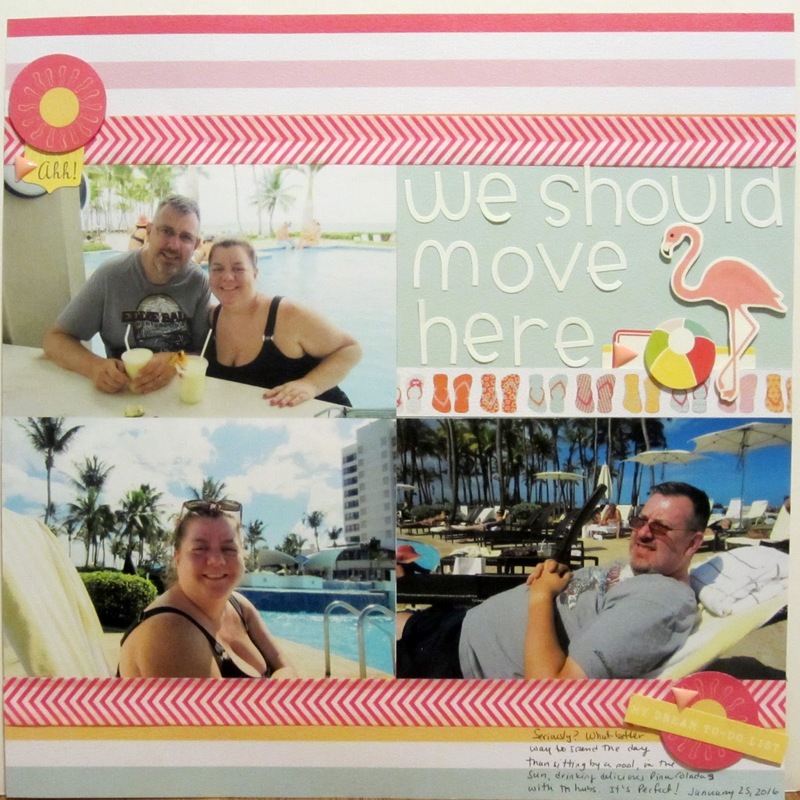 These are obviously pictures of my husband and I at the beach and I just love how the bright and fun this page turned out. Looking at it now, I could say that everything was symbolic: the yellow paper for the sun, the diagonal line mimics the slope of walking down the beach to the water, even the bits and pieces could resemble the shells we were looking for while we walked along the shore. 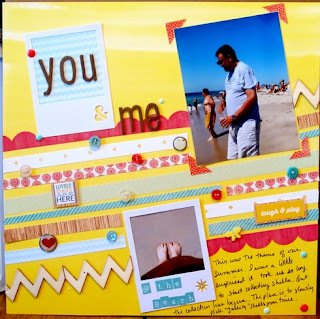 But none of that would be true, I just loved the yellow paper because it was bright yellow and at the time I liked to use red and yellow together (I still do actually) and I didn't want to do another layout with straight horizontal lines so I tilted them a bit. It still works and I still love it. For some reason, it doesn't feel like we're on vacation until we get on the plane. We almost always fly JetBlue because my very tall husband really likes the extra leg room seats. This time we were on a newer plane with most of these seats in the middle of the plane by the emergency exit. I was kind of excited because they had rows with only 2 seats - that meant I won't have to sit in the dreaded middle seat!! But it was right next to the door so there was no window or armrest and the way the plane is shaped made it awkward to just lean against the wall. It wasn't very comfortable and I will try to avoid those seats in the future. 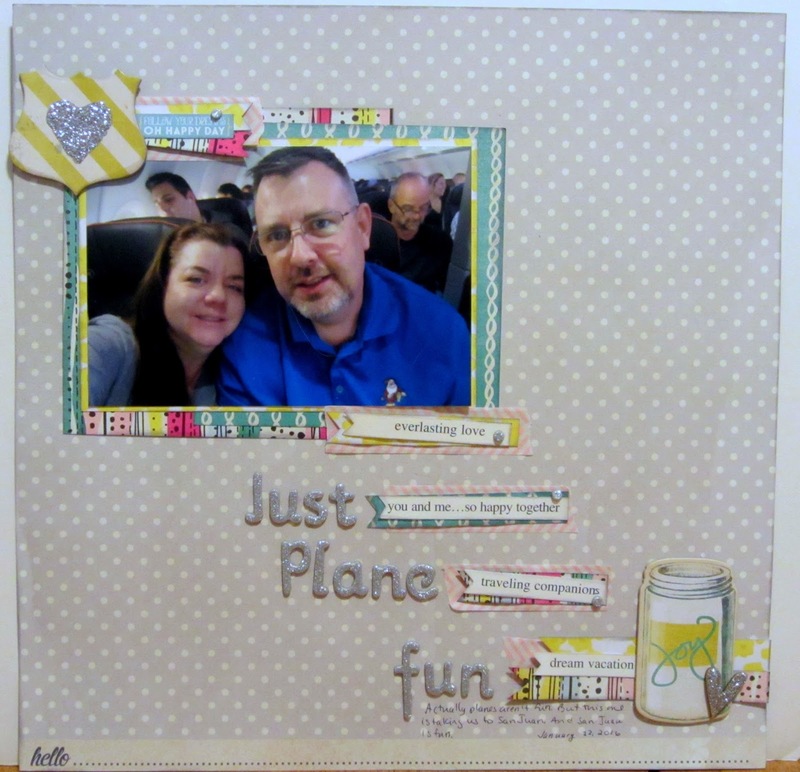 For this layout, I wanted to use that chipboard mason jar which dictated the color scheme of yellow, turquoise and grey. I dug through my scrap bin for all the layering pieces and placed some strips with word phrases from K & Company between the jar and the photo. I like how it filled in the space and acted as an anchor for the title which are some glittery thickers. I also pulled out some stickles to cover a wood veneer heart on the bottom and covered the heart that was on the striped shield (I'm not crazy about how that looks...but I was committed). There are a couple of enamel dots here and there for texture. All in all, it's pretty simple but I like and it's done. Surf and Sun and Iguanas Oh My! I'm not sure why, but I don't usually take too many scenery pictures and very rarely make layouts with them even though I print them out. 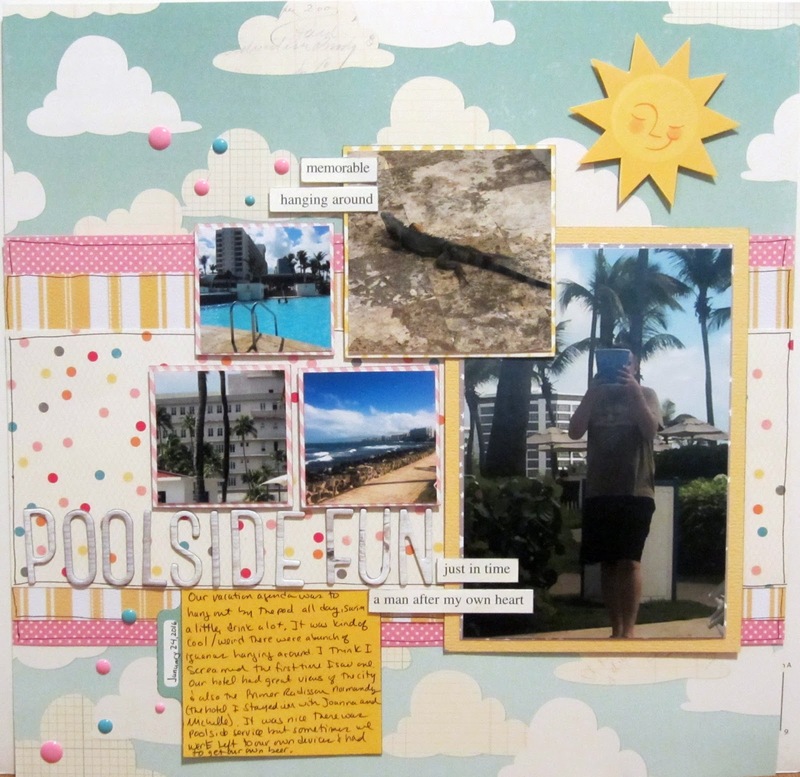 I only scrapbooked this set from Puerto Rico because they would work perfectly with a weekly sketch posted in the Victoria Maria Scrapbook Group on Facebook a couple of weeks ago. They are basically pictures from our spot by the pool (clockwise starting from top left): our hotel, the Caribe Hilton, one of the few iguanas we saw walking around the pool deck, my husband coming back from a beer run, the ocean and an old closed hotel on the next property. It used to be the Radisson Normandy - I went there with some friends way back when. It was very unimpressive and it was kind of torture staying there and seeing this beautiful resort right next door. 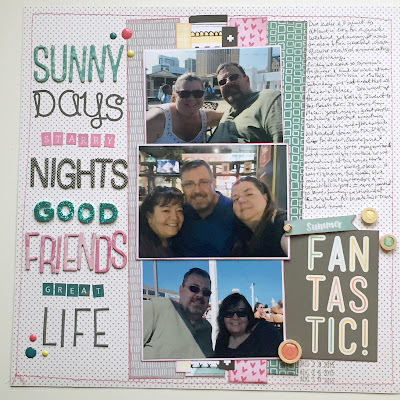 For this layout, I used up some October Afternoon Summer Time collection. The background paper had a sun but I cut out another one from a cut-apart sheet and popped it up for some dimension. I usually ink the edges for some definition but I like to outline brighter patterned papers. With a lot of pictures and a lot of patterns, I kept the embellishing simple. The title is American Craft Thickers (of course) then I pulled out some K & Company word strips and added some enamel dots to call it done. Smile! It's a project life card! 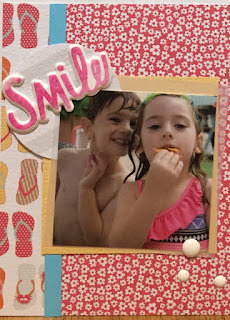 Check out my card on the Sketches in Thyme PL Blog! Back in January, my husband and I went to Puerto Rico for vacation and stayed at the Caribe Hilton. The bar in the lobby, the Caribar, is considered the birthplace of the Pina Colada. Of course, we had to have one and I must say it was amazing! All of the ingredients were fresh and measured to create the perfect drink. The layout is pictures of us and a picture of our delicious drinks. I matted the pictures with black cardstock to make them pop off the colorful background. The circles are chipboard frames from my stash from probably a decade ago. They were perfect here since the flowers are the same colors on the layout plus and I liked the phrases written on them: celebrate life, seize the day and follow your heart. I added journaling to one, coordinating patterned paper to another and filled the last one with buttons in colors that coordinated with the striped paper. For some reason, I usually struggle working with circles but I think this came out nicely. The title is the official name of the pina colada song. Yep, I'm still working on vacation pictures. These pictures pretty much sum up what we did all day...sit by the pool, get some sun, hop in the pool every once in a while and enjoy some libations. I loved that the resort had poolside service and sold buckets of beer. The layout came together quickly. I used all Fancy Pants papers, even the suns are punched out from patterned paper. The themed stickers are from October Afternoon. As far as I know, there are no flamingos in Puerto Rico but it didn't seem wrong to use one on the layout. I added some washi tape and enamel triangles for texture and pulled out an older sheet of Doodlebug letter stickers to finish it up. This is the absolute worst picture I have taken of Bob ever, in her entire life. She is actually a very pretty cat but I caught her mid yawn and ended up with this gem. It looks like she just got of a boxing ring. It's a couple of months old and I still laugh every single time I look at it. To be honest, I don't really know what I was thinking with this layout. It looks like I was attempting to use the pink from the background as my main color but I am a couple of shades off with the other papers. I used balloons and flowers because they make me happy, just like this crazy picture. Here's a picture of Bob in her normal cute state. This is layout 12 out of 40 for my no buy challenge. Back in May, we went to my niece's recital and then a celebratory lunch after. It was her third performance and as always, a group of pretty little girls in cute costumes dancing to Little Bitty Pretty One, it was super adorable. We all gave her flowers and she was so proud of how well she and her class did. She's also "over it" so this was her last recital. There were a lot of pictures that didn't come out so well so I kept them small and fit all of them onto a single page. There's a lot of crate paper here including the journal card with the butterflies and small text which is what inspired me to add the butterflies on top by the title. I also used Simple Stories, Dear Lizzy, Basic Grey and My Mind's Eye products. 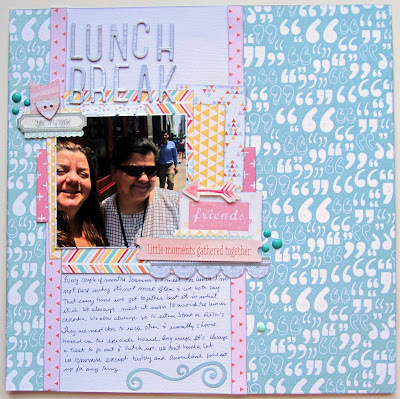 This is layout 11 out of 40 for my no buy challenge. There are many great things about living in NYC and one of them the entertainment. 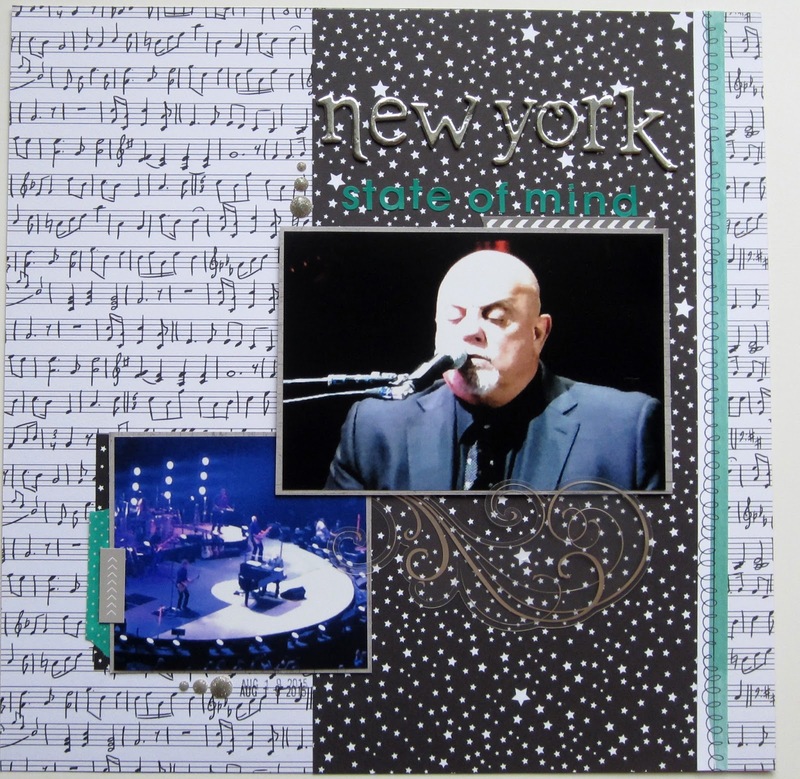 For the past three years, Billy Joel has been playing at Madison Square Garden every month. My husband is a huge huge fan so we get tickets every year. These pictures were taken at the January 2016 show. He changed up the play list a little and it created a really energetic vibe plus Jimmy Fallon made a special appearance (I don't think there's anything this guy can't do). It was fantastic. The layout is pretty simple since I used busy patterned paper. I love the silver foil thickers for the title and the teal for a little pop of color. I don't mean the Denver Bronco's...we're talking Seaford Bronco Football here! These pictures are from their opening day ceremony. My nephew is on the football team and was affectionately referred to as the animal by his coach. He's a strong player and runs super fast. My niece was a flyer on the cheerleading squad. It was a fun event where every player was called up by name and each cheer squad did a routine. The team and town spirit was amazing!! 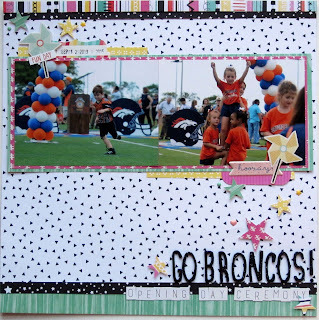 On this layout, I kept the background simple but added some bright colors. It looks graphic with all the black accents and I finally got to use those Echo Park pinwheels I never thought would be used then I added some stars since I think they are superstars! We go to Disney quite frequently, so we have developed certain habits whenever we go. We usually stay in the same resort since we are vacation club members. We have favorite rides, restaurants, all sorts of things. I'm not sure if my husband planned it or not but after scrapbooking several of our Disney arrival pictures, I noticed that he is wearing the same shirt several trips in a row. Now, he purposely wears it. One of the other traditions we have is going to Fuddrucker's on our way to the resort. The one nearest to us closed years ago and the closest one is in New Jersey and hardly worth all the tolls we would pay to get there so we make a point to stop there on our way in. I made this layout for a sketch challenge from A Cherry on Top. It's their weekly Becky Fleck sketch challenges. They tend to use lots of smaller sized pictures but are easily modified for 4x6 prints which is what I did here. There's all sorts of companies represented here: My Minds Eye, Echo Park, Dear Lizzy, Pebbles, Crate Paper and Amy Tangerine. If you like sketches or challenges in general, check out A Cherry on Top they have oodles of them! 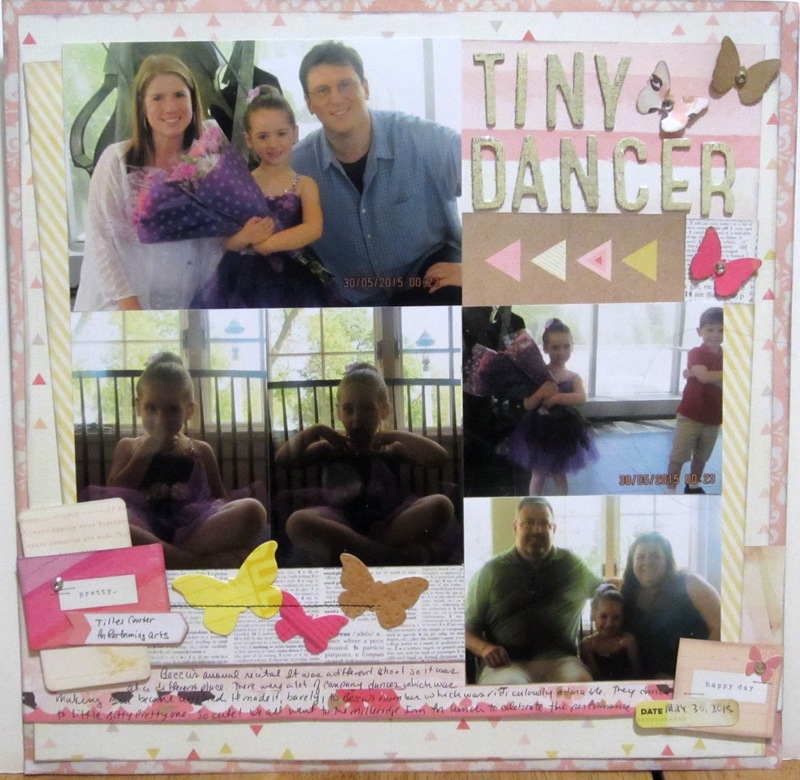 When I order pictures, I usually order favorites in two different sizes so I have options when I am scrapping an event. This of course means I end up with lots of extras which I use for more random layouts about people, relationships, and so on instead of event driven pages. That's what this picture is...an extra from a Disney vacation. 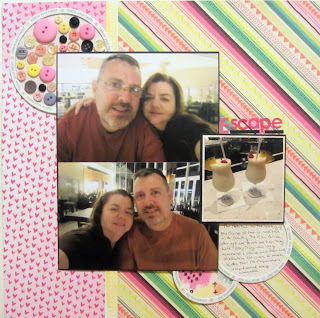 The layout is just about us being happy together. 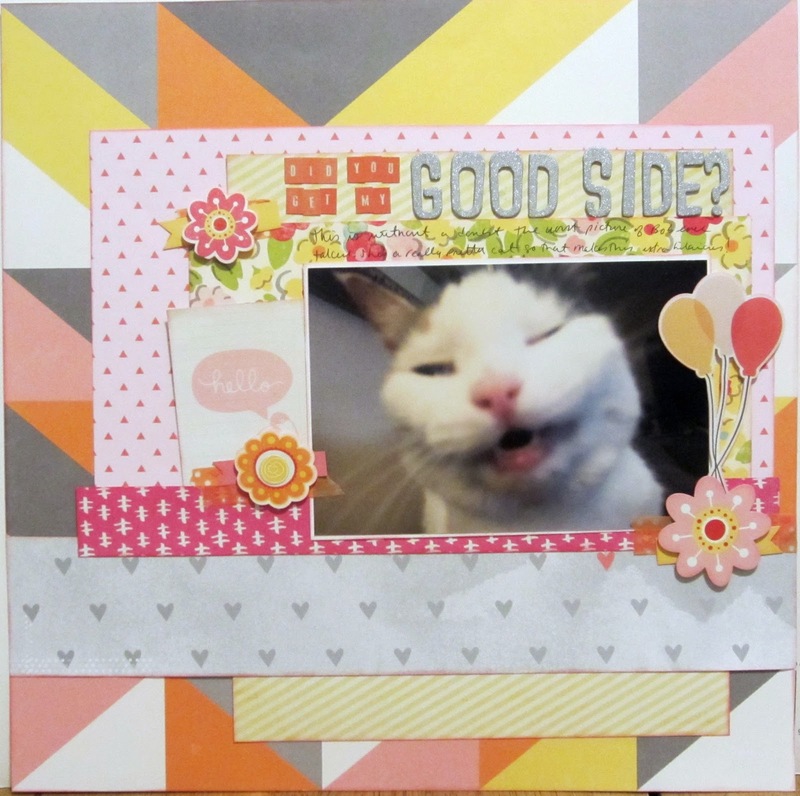 For the layout, I was inspired by a freestyle challenge on the Victoria Marie FB group which called for using shapes other than squares and rectangles. That's a little hard to get away from all together but it finally got me to use giant triangles for the background I've been seeing a lot of lately. I used a bunch of scraps for layers behind the photo and the two clusters, including clouds because I can be corny like that Best of all, I used a number thicker! I nearly never use numbers so it was thrilling to me to use one. I mentioned previously that I am a maven for the Sketches in Thyme Project Life blog. They have amazing sketch designers so I am glad to be a part of the design team. The only hitch is that I am not really a pocket page scrapbooker, an occasional gift album maybe, but I am pretty faithful to the 12x12 format so this has been a fun challenge for me. This is a picture of me with my niece and nephew. We spent the afternoon playing and decided to take a picture to send my mother who lives out of state. That's why my niece was waving...we were all saying hi to Gram (that's what they call her). As I mentioned, I am trying to work through my stash and the first thing that always comes to mind is patterned paper. So on this layout, I decided to mix and match several colors and patterns starting with the hot pink brick paper from Webster's Pages. I selected the floral paper since it has dark pink in it too which brought in shades of yellow, pink and green. 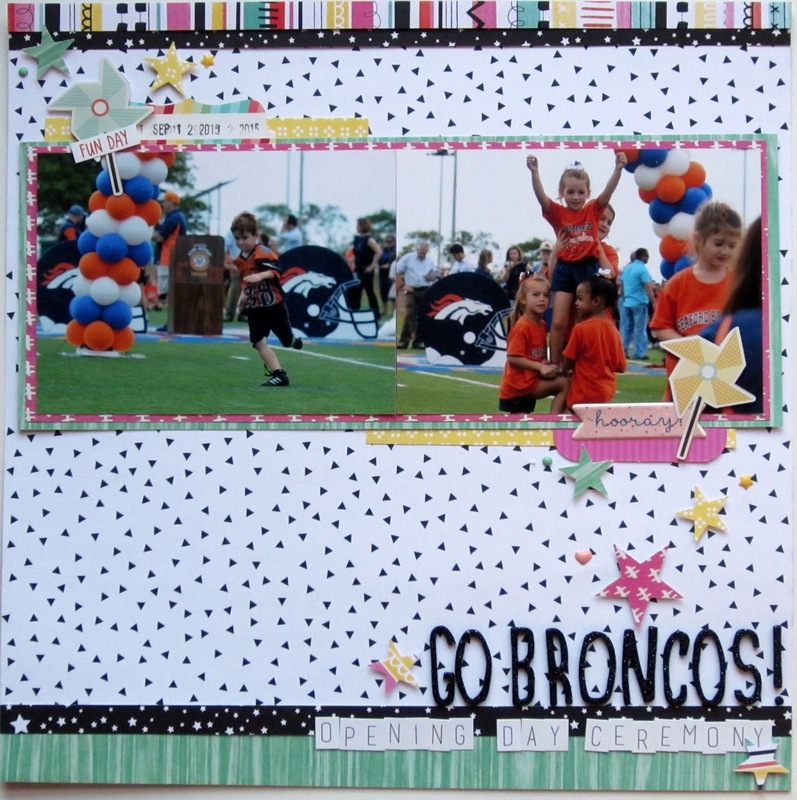 Now it was easy to pick out other papers for layers and embellishing. Since the patterns are so bold, I kept the embellishments simple and made clusters of with circles and flags cut from patterned paper and added the buttons and enamel dots. This is one of those catch up layouts from last month. It was a really fun layout to pull together even though there are a couple of things I would change if adhesive wasn't so sticky. ha! I love how the title came out and I love that I used so many letter stickers even though there's still a million in my stash. 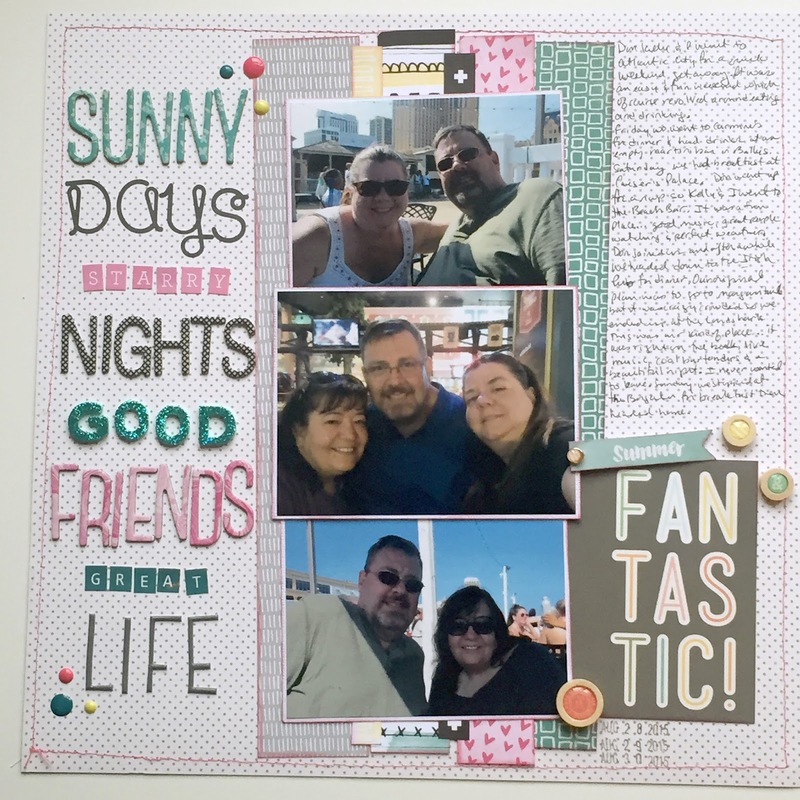 The pictures are from a weekend in Atlantic City with one of our friends. We spent the day and evening hanging out on the Boardwalk on a perfect summer weekend. There's a big mix of products from Dear Lizzy, Studio Calico, Amy Tangerine, Crate Paper, Simple Stories and American Crafts. 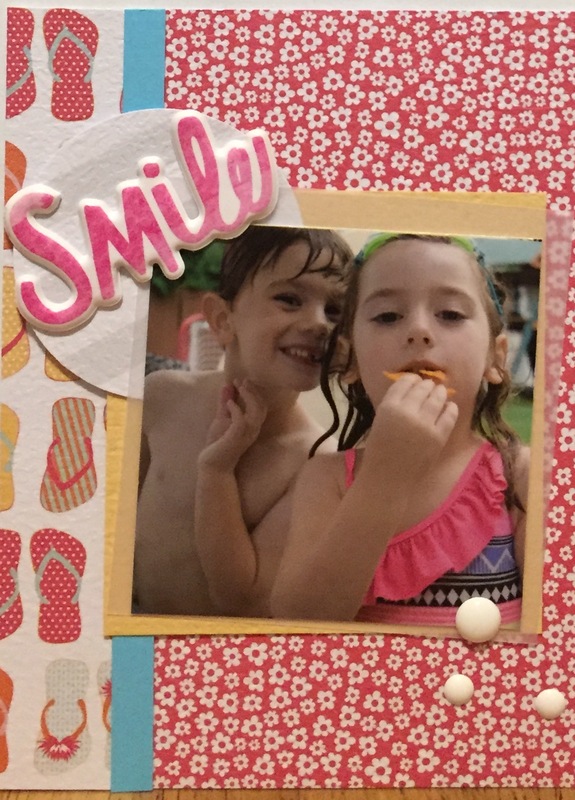 I am trying to wrap up scrapbooking pictures from the summer of 2015. This picture is with one of my friends from high school. We work a few blocks apart and catch up every few months. It's nice because it's pretty much the only time I actually go out to lunch. I kept everything on this page pretty tight around the photo. There are quite a few layers and embellishments directing your eye to the picture. Since that left a lot of white space, I decided to use a somewhat bold patterned paper for the background. There is a mix of older and really old supplies on this page from My Mind's Eye, Dear Lizzy, October Afternoon, Fancy Pants, Teresa Collins and Echo Park along with Glitz Designs, Little Yellow Bicycle and Adorn It who are sadly closed now. 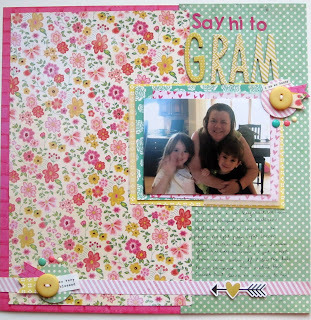 This is layout 10/40 for my no buy challenge. I'm 25% there!! This here is my nephew at ice skating lessons from just about a year ago. 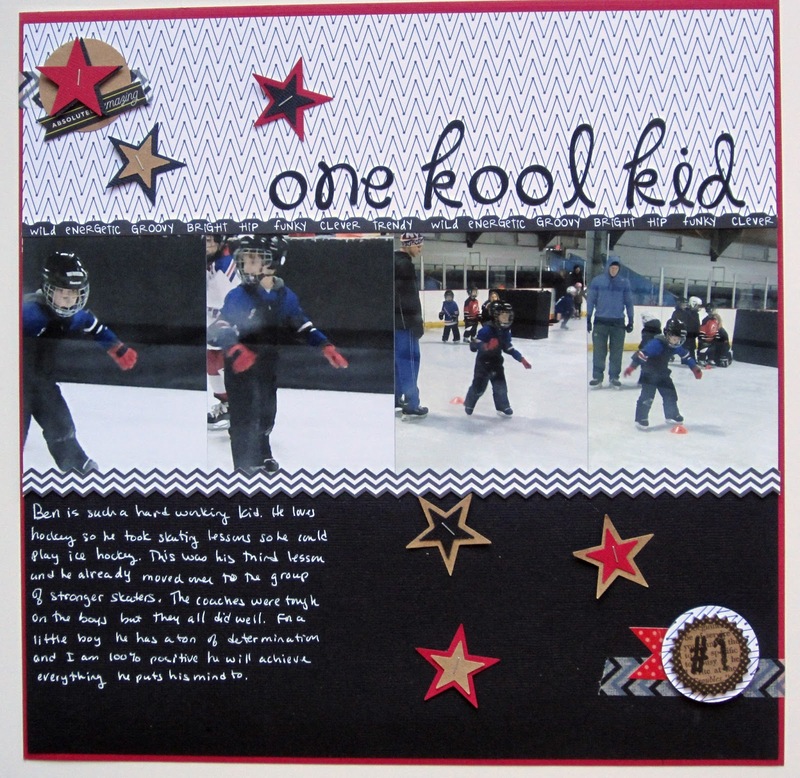 He loves all sports but hockey is his favorite so it's natural he wanted to take skating lessons. He works so hard at whatever he wants to achieve. By week three, he was moved to the group of stronger skaters. It's crazy and admirable for such a young boy. He was just 5 in these pictures. The layout itself is pretty simple and I used lots of old products. The title letters are Doodlebug's Loopy Loo stickers from 2008, the wordy border sticker is by KI Memories in 2007. But there's also some Amy Tangerine and Echo Park products too. I want to give a special shout out to the Gelly Roll pen by Sakura. It writes smoothly and stands out beautifully on the black cardstock. 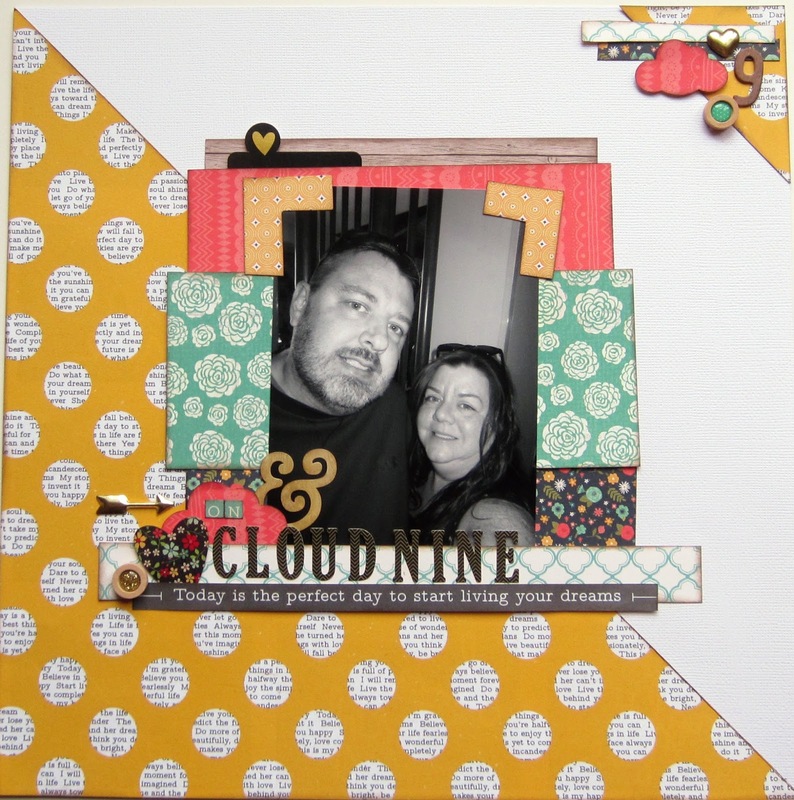 This is layout 9/40 for my no buy challenge. The is a picture of the tree we put up for Christmas 2014. It was the first tree we decorated in years. We used to go all out with decorations then stopped when it became a burden and inconvenient so we started over with a little table top model. It was perfect! I wanted to use the Photo Play Dear Santa but I found the papers within the line didn't match as well as I would like. There were white and cream based pages plus the reds were different shades. I ended up using one sheet as the base page to create a page frame and a few stickers. 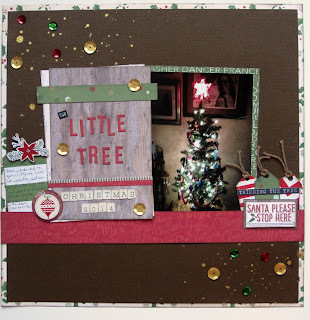 The rest of the Christmas paper comes from My Mind's Eye Sleigh Bells 6x6 pad plus some pieces from my 2014 December Daily kit from Gossamer Blue. Starting in January, I've been in a no buy challenge on Facebook and have decided to make 40 layouts before I shop for new supplies. This is layout 8. I'll catch up posting those layouts over the next couple of weeks.